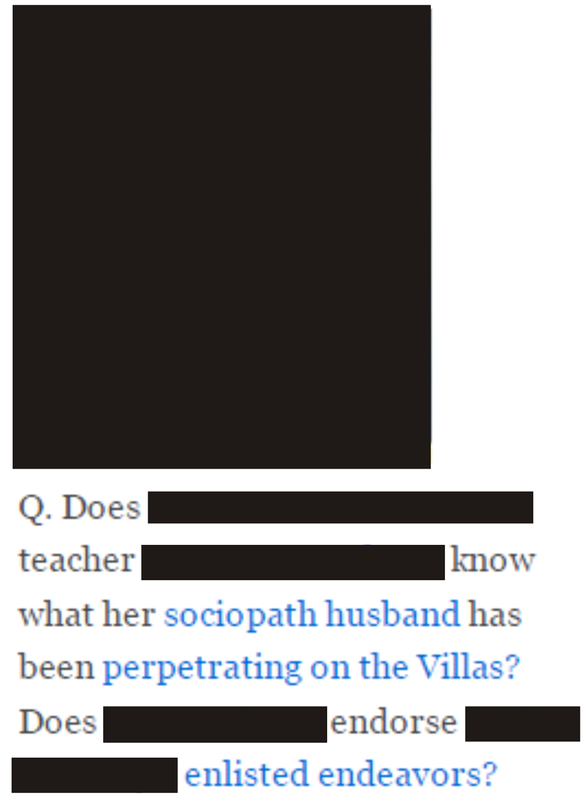 What Kind of Malevolent Sociopaths Intentionally Endanger a Teacher and Children? Three time criminal defendant, alcoholic, drunk driver, and ex long-time illegal drug addict Bill Villa (a.k.a. William P. Villa in his arrest records) and his disgraced, self-described “teacher” wife Arcangel “Angie” Villa use their misogynist, racist, and malicious hate blog’s “Foes List” and other social media to smear dozens of innocent victims and to menace them with references to and threats of violence. Bill and Arcangel “Angie” Villa also often indiscriminately attack the personal and professional reputations of “Foes List” victims’ spouses, families, employers, and associates with lies, half-truths, and innuendo and menace them with references to violence for the purpose of intimidation and to “punish” them for associating with “Foes List” victims. Who but the deeply demented would publish a "Foes List" of nearly 60 community leaders they believe are arrayed in a conspiracy against them? Ex long time illegal drug addict Bill Villa and his delusional wife Arcangel can't help themselves. Because Bill and Arcangel “Angie” Villa harbor the paranoid delusion (paranoid delusions being common among ex long time drug addicts like Bill Villa) that the dozens of professionals and community leaders they victimize on their “Foes List” are arrayed in a vast conspiracy against them. They delusionally believe this imaginary conspiracy is headed by Lehigh County District Attorney Jim Martin who is currently pursuing legal action against three time criminal defendant Bill Villa. when, in fact, alcoholic and ex long time illegal drug addict Bill Villa is a court documented drunk driver. when, in fact, Bill Villa is a three time criminal defendant. when, in fact, three time criminal defendant Bill Villa was convicted of criminal harassment (though overturned on a technicality when his victim appeared late for the appeal). when, in fact, Bill Villa is the one to have stalked a victim and published an account of his stalking on their hate blog. when, in fact, Bill Villa spent years sponging off his elderly mother. when, in fact, after more than a decade of business failure, Bill Villa was forced to take a nearly entry-level job at 62.
when, in fact, they publish a blog solely to smear nearly 60 victims with lies, half truths, and innuendo. Why Would Cyber Stalkers Bill and Arcangel “Angie” Villa Intentionally Endanger a Teacher and Children? How Are the Villas Intentionally Endangering a Teacher and Children? How Can Malicious, Disturbed Sociopaths Bill and Arcangel “Angie” Villa Be Stopped Before Someone is Harmed? Tell Erie Insurance Group: Stop Enabling Bill and Archangel "Angie" Villa’s Abuses! Thank Bill Villa’s Bosses for Forbidding Him to Abuse and Threaten Us "On the Clock"! How Can Potential Victims of the Villas Protect Themselves? Whether these untruths are actually believed by Bill Villa because of cognitive damage from his many years of highly destructive alcoholism and addiction to illegal drugs, or because of organic mental illness, or whether they are nothing other than completely malicious lies (See "In Search of... Bill Villa's 'Verifiable Facts'"), it is certain that Bill Villa (See "20 Questions Bill Villa Won't Answer. Even with Lies"). has never produced a single witness or shred of evidence corroborating his false accusations of any wrongdoing. Against anyone. Ever. Bill and Arcangel “Angie” Villa's deranged behavior toward their imaginary “Foes List” has gone so far as their demanding criminal charges be brought against anyone who simply defends their reputation by challenging the Villa’s baseless accusations. Bill Villa also exploded into a screeching drama queen rage and demanded that criminal charges be brought against several victims when his publicly available arrest records were exposed. Clearly, the demented Bill and Arcangel “Angie” Villa harbor the delusional belief that free speech applies only to them. One can reasonably ask: What kind of people would even maintain a “Foes List”, let alone publish it in order to smear their innocent victims with lies and threaten them with reference to and threats of violence? And smear and threaten those victims’ families, employers, employees, businesses, and associates? And then smear and threaten their victims once again if they should dare to simply defend their families and themselves? Deceitful, hateful, and deranged sociopaths who have now stooped so low as to endanger the distinguished teacher wife of an affiant / potential witness against Bill Villa and the schoolchildren who surround her -- with a depraved indifference to their safety. 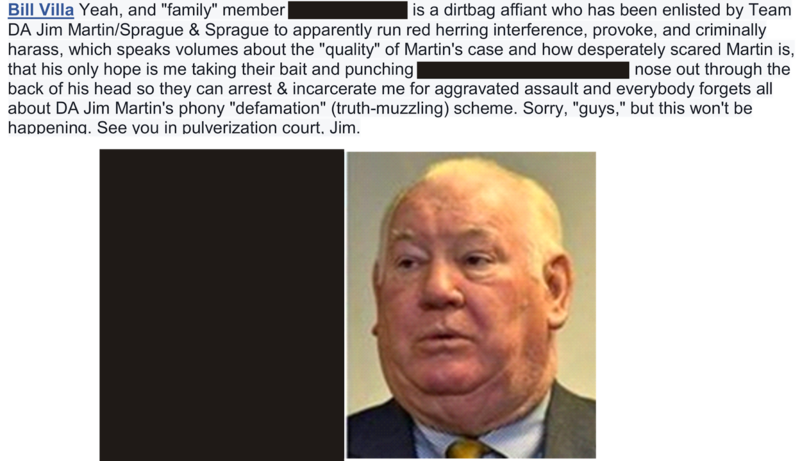 For more than a year, Bill and Arcangel “Angie” Villa have been waging a continuous hate blog attack on an affiant / potential witness in Lehigh County District Attorney Jim Martin’s legal action against Bill Villa, the three time criminal defendant, alcoholic, drunk driver, ex(?) long time illegal drug addict and Creative Director at Allebach Communications in Souderton PA. In the wake of inciting a threat of violence against the affiant / potential witness, they are now targeting the victim’s distinguished teacher wife -- with a depraved indifference to the safety of the elementary school children who surround her every school day. Three time criminal defendant, alcoholic, drunk driver and ex long-time illegal drug addict Bill Villa (a.k.a. William P. Villa in his arrest records) first made a belligerent reference to violence by ranting his delusional belief that he is being “baited” by Lehigh County District Attorney Jim Martin and numerous others to commit an act of violence against an affiant / potential witness against him in retaliation for that affiant simply coming forward as part of his civic duty (the delusional Bill Villa has expressed this irrational belief of being “baited” and “forced” to commit an act of violence several times in the past and in several venues). In response to Bill Villa's demented reference to retaliatory violence, an obviously deeply disturbed individual, unknown to the affiant / potential witness but clearly associated with Bill and Arcangel “Angie” Villa, named Joseph Charles Timothy Bauer III (former dive bar bartender now employed by XPO Logistics of Easton PA) offered to carry out that act of retaliatory violence on behalf of Defendant Bill Villa. In exactly the same timeframe as Bauer’s explicit threat of violence, Defendant Bill Villa (a.k.a. William P. Villa in his arrest records) posted photographs of the wife of the affiant / potential witness at work, her full name, and the school in which she teaches. He went on to do so repeatedly in several locations. It is impossible for a reasonable person to believe that this action was not taken in an effort to incite a second threat of violence (or at the very least to attempt to intimidate by instilling the fear of one), this time against the affiant / potential witness’s wife -- either from the deeply disturbed Joseph Charles Timothy Bauer III or another similarly deranged "supporter" of Bill and Arcangel “Angie” Villa like him. Bill and Arcangel “Angie” Villa's intent would seem to be in the hope of seeing violence carried out against the affiant’s wife -- either at home (Bill and Arcangel “Angie” Villa had, shortly before their inciting a threat of violence against the affiant, published the affiant / potential witness's and his wife's phone number, address, and a photo of their home) or, even more chillingly, at work -- where she is surrounded by school children who could easily be harmed if Bill and Arcangel “Angie” Villa's desired threat were to be carried out. It is cause for grave concern that three time criminal defendant, alcoholic and ex(?) illegal drug addict Bill Villa, his sociopath wife Arcangel "Angie" Villa, their disturbed accomplice Joseph Charles Timothy Bauer III, and/or other as yet unknown mentally ill individuals incited by them may carry out acts that could end in tragedy. Though we concede that, as an alcoholic and ex long time illegal drug addict, the diminutive, wizened, Truman Capote-esque Bill Villa poses no conceivable physical threat to any normal man, our deep concern is that he and/or similarly deranged accomplices may physically attack the affiant / potential witness's wife as he so often baselessly attacks the reputations and privacy of women and menaces them with references to violence on his hate blog. Given belligerent, delusional three time criminal defendant, alcoholic, drunk driver and ex long time illegal drug addict Bill Villa's rapidly deteriorating mental state, it is not at all unreasonable to demand that all possible precautions against him be taken -- hopefully including confinement to a mental health facility for diagnosis. Engaging in any form of behavior that could present any possible threat -- of any kind -- to schoolchildren and the innocent educators and school staff around them, indicates that three time criminal defendant, alcoholic and ex(?) long-time illegal drug addict Bill Villa (a.k.a. William P. Villa in his arrest records) and his disgraced, unemployable, self-described "teacher" wife Arcangel "Angie" Villa are clearly deeply disturbed and deranged sociopaths. Only coordinated action by a concerned community committed to the safety of children, educators, and school staff can put a stop to the menacing abuses Bill and Arcangel “Angie” Villa are perpetrating on an affiant / potential witness, his wife, and, with a depraved indifference to their safety, the elementary school children around her. As we at BillVillasVictimsUnited.com say in our Mission Statement, we look forward with great hope to the day that we can remove this information resource site from the web as a result of Bill and Arcangel “Angie” Villa putting their decade of demented hate, misogyny, racism, compulsive spewing of lies, half-truths, innuendo, violent references and threats of violence behind them to rejoin the community as a well-adjusted, productive citizens. But, if that doesn’t happen, and if Bill and Arcangel “Angie” Villa's barely literate hate blog and other social media lies, half-truths, innuendo, and references to / threats of violence are not removed from the web by sundown on Wednesday, May 31, we will be forced to carry out the first of numerous monthly campaigns to bring awareness of the Villas’ abuses to a much wider audience. An audience they don't want. Because Bill Villa has clearly indicated he does not want his hate blog's racism, misogyny, delusional lies, and demented references to / threats of violence to become common knowledge throughout the Food and Beverage industry, we will do just that to put a stop to his abuse of nearly 60 fine, upstanding people. It doesn’t have to be this way, Bill. All you need to do is stop victimizing us with your hate blog and on various other social media. If you or a loved one are on Bill and Arcangel “Angie” Villa's “Foes List”, and have been the target of references to or threats of violence, we at BillVillasVictimsUnited.com strongly urge you to contact your local police and/or the Pennsylvania State Police. While mental health authorities rarely intervene directly, it will be extremely helpful if they have first hand accounts of Bill Villa's deranged abuses on file to aid in any subsequent law enforcement investigation or action against him. Please prepare a detailed account of any deranged abuse you have suffered at the hands of Bill and Arcangel “Angie” Villa and forward it to your local mental health authorities. In large part, Bill and Arcangel “Angie” Villa have been able to continue such egregious abuses because of unethical behavior by Defendant Bill Villa and Attorney Michael Shay (an attorney retained and paid by Erie Insurance Group to represent Villa). After the affiant / potential witness wrote presiding Judge John Braxton asking that the Judge put a stop Defendant Bill Villa's abuse of the affiant’s teacher wife -- with a depraved indifference to the schoolchildren around her -- as well as baseless smears vandalizing the affiant's reputation, Attorney Michael Shay and Defendant Bill Villa's improperly wrote the judge in an effort to prevent the affiant / potential witness and his teacher wife from obtaining the requested protection. Defendant Bill Villa and Attorney Michael Shay lied to Judge Braxton, falsely claiming that the affiant / potential witness’s account of Villa’s abuses was “false evidence” and had been “debunked” -- while failing to present even a shred of evidence to support their false claim (nor putting three time criminal defendant, alcoholic, and ex illegal drug addict Defendant Bill Villa's under oath when repeating the unethical lies cooked-up with Attorney Michael Shay). 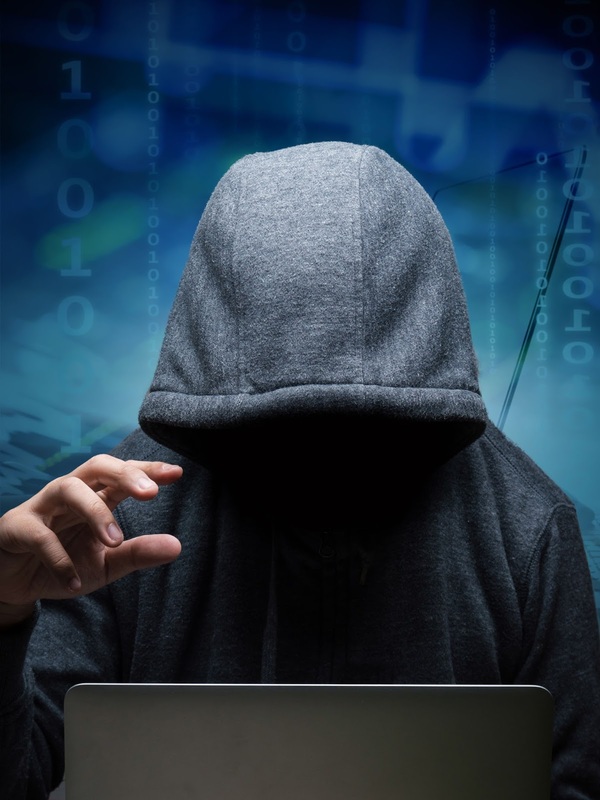 Their unethical lies helped enable Defendant Bill Villa to continue in his attempts to intimidate an affiant / potential witness with online harassment and intimidation of family members. Defendant Bill Villa has also, for example, published the personal contact information of the affiant / potential witness's younger sister -- a single woman who lives alone -- in an attempt to intimidate. Further, the deranged alcoholic and ex(?) drug addict Defendant Bill Villa is now publishing pictures of the affiant / potential witness’s 88 year old Mother and his Mother’s twin sister for no apparent reason. It would appear that three time criminal defendant, alcoholic, and ex(?) illegal drug addict Bill Villa and Erie Insurance Group-paid Attorney Michael Shay have made underhanded lies, malicious reputation vandalism, and attempts at intimidation of an affiant / potential witness an integral part of their legal "strategy." We would also urge you to apprise your local school district’s Board and Administration should Arcangel "Angie" Villa attempt to gain employment there. Thank Bill Villa’s Bosses for Forbidding Him to Abuse and Threaten Us "On the Clock." Many of Bill Villa's smears and threats have originated during standard business hours while in the employ of Allebach Communications of Souderton PA.
His employer Mr. Allebach put a stop to that. When this was brought to the attention of Jamie Allebach, Chief Executive and Creative Officer at Allebach Communications, he exhibited great professionalism and integrity (and courage -- given that it could land him on Bill Villa's “Foes List” one day) and forbid Bill Villa from continuing to do so on company time. If three time criminal defendant, alcoholic, and ex illegal drug addict Bill Villa's abuse or references to / threats of violence against you or a loved one have originated during standard business hours (as did the references to and threats of violence by Bill Villa against an affiant / potential witness and his teacher wife), we urge you to contact Management Team members of Bill Villa's employer, Allebach Communications. It may also be helpful that one of the clients Bill Villa serves as Creative Director at Allebach Communications is Steak-Umm, the well known nation-wide food producer. Steak-Umm very generously supports the fight against the abuse of women. One can safely assume that members of Steak-Umm's Management Team are also opposed to the bullying and menacing of a female teacher with a depraved indifference to the school children around her as Bill and Arcangel “Angie” Villa are currently doing on their hate blog. Our goal is to have victims, their loved ones, and BillVillasVictimUnited.com members reach each listed Quaker Maid Meats executive with multiple requests for help. Bill Villa has told many of his “Foes List” victims that his intent is to have his hate blog disinformation show-up on Google searches for the purpose of damaging their personal and professional reputation, livelihood, and prospects -- and he'll often go on to do the same thing to victims' family members, friends, business associates, etc. What Bill Villa desperately doesn’t want is for his clearly delusional ranting and his demented references to / threats of violence to come to the attention of decision makers throughout the Food and Beverage industry. So we realized that, ironically, the one thing that might put an end to three time criminal defendant and ex illegal drug addict Bill Villa's victimizing of the nearly 60 of us with lies, half-truths, innuendo, and references to / threats of violence is bringing that abuse to the attention of a much wider audience. An audience Bill Villa doesn’t want. The Food and Beverage industry. Then we asked ourselves how we could reach a broad audience throughout the Food and Beverage industry to “build the Bill Villa brand” as quickly and effectively as possible. And we realized we have natural allies in advertising agencies throughout the Food and Beverage industry. Finally, we realized that spotlighting the demented behavior of three time criminal defendant, alcoholic, drunk driver, and ex illegal drug addict Bill Villa and his rapidly deteriorating mental state across the Food and Beverage industry would be both a protective measure to us at BillVillasVictimsUnited.com and a competitive advantage to any Food and Beverage advertising agency helping us. Just as Bill Villa's victims want nothing to do with him, nor will any Food & Beverage business's Management Team want him anywhere near their people and their businesses after they’ve seen his hate blog and his smears and threats of violence (not to mention his rampant racism and misogyny). We intend to ensure that they fully understand the risk to themselves, their families and the potential liability should Bill Villa in any way menace their employees and their families -- and that such menacing can result from even so much as expressing the slightest disagreement with three time criminal defendant, alcoholic, and ex long time illegal drug addict Bill Villa (a.k.a. William P. Villa in his arrest records). Help us offer the the Food & Beverage agency executives listed below the opportunity to build the brand of a really exotic nut -- three time criminal defendant, alcoholic, drunk driver and ex illegal drug addict Bill Villa! Are your spouse and children safe from victimization by Bill and Arcangel “Angie” Villa, their hate blog, and the mentally ill individuals that support them? Are your employees and their families safe? What is your legal liability if you do nothing to protect your employees and their families from victimization by Bill and Arcangel “Angie” Villa’s hate blog and the mentally ill individuals that lash out because of it? As we at BillVillasVictimsUnited.com say in our Mission Statement, we look forward with great hope to the day that we can remove this information resource site from the web as a result of Bill and Arcangel “Angie” Villa putting their decade of demented hate, misogyny, racism and their compulsive spewing of lies, half-truths, innuendo, and violent references / threats behind them to rejoin the community as well-adjusted, productive citizens.